Thus you put your time into your work which gives you a wage income that is used to pay for stuff that goes back to you.People with a credit score can go into debt. Today almost anyone can do this. In this case debt can be use to pay for stuff and the wage can be used to pay for debt such as credit cards, car loans, mortgages, student loans, etc. This is the way most people handle their personal finance. Very few people pay cash anymore and financial success depends on being good at handling debt. Many websites will tell you how to do that. You will notice that the debt box has a small leak of money that goes to other people. This is the price you pay for debt. Investors don’t pay other people to use money. They are the other people. If you want to be an investor, you need to build income generating assets. Investing is mainly about escaping the need for a wage income. Initially though other people will not be paying you enough money to cover all your stuff, so your cash flow will look something like this. What can I say, I love making diagrams. Note that as soon as you have assets, you start getting an additional cash flow. If you want a larger cash flow, you need more assets. 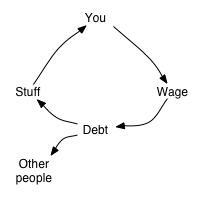 Personally I was so bent on accumulating assets that I reduced the amount of stuff I bought so I could save 75% of my wages.Once you have accumulated a sufficient amount of assets, the cash flow cycle will look like this. At this point you will be financially independent. This is the stage I am in. My assets pay all my expenses in the form of dividends and interest. In other words, other people pay for my stuff. As I keep adding to my assets, my asset based income grows larger. Since this income is larger than what I spend, the assets can compound exponentially and aid in growing my income.Note that you are only financially independent if your assets can provide you with sufficient cash to cover your “stuff”. It does you no good, if your assets are your house or if they are sitting in a retirement account where they can’t provide income. Of course I could retire in which case my cash flow would look like this. Notice the absence of a wage income. It is not needed because there will not be any creditors knocking at the door like a few steps above nor will there be any problem in putting food on the table. And Section 7.1 in the book which contains a much expanded discussion of these diagrams + additional diagrams. Note that amazon lets you read chapter 1 and a bit of chapter 2 for free in case you’re interested. 46 users responded in " Cash flow diagrams for the poor, the middle class, and the investor class "
There are two kinds of people in this world – those who pay interest and those who make interest. Can you give please few examples for ASSETS? Thanks 🙂 Assets that provide an income can include savings accounts, CDs, mutual funds, stocks, bonds, REITs, real estate (that you don’t live in), oil trusts, royalties,… I would generally not include things like art, cars, baseball cards, jewelry, the house I live in, and other doodads unless traded for a living. Will those be able to provide you sufficient income? the interest rates on savings,cds and etc are very low today, index mutual fund not doing well since 1-1-08, not to mention stocks…reit diving as well, RE losing value, rental income not changes. overall, a little scarey, no? not familiare with oil trusts and royalties, but heard they are pain during tax time. thx for the quick response…all the best. Yes it is scary – loss of principal is a genuine concern, actually a greater concern than market returns, so I have to design my portfolio to reflect that. As long as my stocks don’t start cutting dividends (which I seriously doubt they will) I should be alright. They do provide enough income as long as you have enough of them. Generally one should aim for 25 times annual expenses in assets and then some. The easiest way to achieve this is to cut down expenses and learn to spend money very efficiently. Well drawn and simple diagrams. If only our education system could slip this into the syllabus and teach all our children from day one. Great post and diagrams! I’d almost be tempted to draw an arrow going FROM assets and back into itself to show the compounding of assets (when it exceeds your stuff). @ mr. cheap – I thought about that, but then I figured I would need a loop at the debt diagram as well and possibly another arrow to retirement savings, so I decided to keep it simple. Although it’s been more than 5 years since I read RDPD, the idea of cash flow was the one idea that stuck in my brain and made me decide to start doing things differently. “success depends on being good at handling debt” Love it. One option is building business(s) as your assets. I’v enjoyed building several. Having enough money to spend & save is the best of both worlds. That, of course, obscures the very real existence of people who do both. Few real fortunes were made without incurring debt or receiving a windfall. McDougal, what’s a “real fortune”, and how much is a windfall? Somewhere here, we need to add that you also need a goal: ‘frugalists’ can live by (or close to) the assets-funding-their-stuff model simply by living cheap. Hobos, do it by abstaining, altogether – supplanted by a bit of scrounging, stealing, and/or begging as fits their personality. I live off the last diagram @ $250k+ p.a. … it’s different for everybody. The diagrams were pretty neat. It definitely puts the concept of “debt” in a sense that anyone can understand. As you mention work is trading hours for dollars, and you only have so many hours. Thus if you can receive a small portion of many others dollars from work your income is theoretically limitless. This however puts workers into the asset class (slavery) and capitalists as slave owners. Your blog name is quite appropo as these ideas are not mainstream but certainly enable readers to see the information in a new way. Mainstream media has nothing new to say and no real insight so they use other tactics (film at 11, 10 best blah …, etc) to get eyeballs on the same information in the same format. You know somebody is deep when they are able to express complicated ideas in simple terms so that the man on the street can understand. I haven’t read all of your blog, so not sure if this is addressed elsewhere, but one weakness to this plan is that it’s possible (I would say likely) that future inflation on essential services will outstrip dividends and investment performance in general. That is, price of food and gasoline will rise X%/year, investments+dividends will rise Y%/year, and perhaps X = (1.2)xY, for example. It depends on what you invest in, of course. I think it would be prudent to invest in some inflation-protected assets, esp those linked to commodities as opposed to real estate. TIPS might be ok. Gold and silver won’t pay dividends but could be slowly sold, an ounce a year or something. The PWTB in this country figured this out a long time ago, and thus have pushed consumerism onto the general public. But even that isn’t enough to prevent smarter, young individuals from entering this plan. So the government in tandem with higher education and the student loan cartel conspired to put an entire generation into debt. They have succeeded. It is extremely difficult to become financially independent when one has student loan debt taking a hefty chunk out of your wages. The government further went on to make student loans non-dischargeable in bankruptcy. You can eliminate stuff to the bare minimum and still not make progress until your 30s or 40s if your debt load is high. The jobs are not there to pay off that debt load quickly. This was all designed intentionally. The tax system is in place also to further punish those that want to escape the wage cycle. Hence why I suggest people avoid paying for higher education or make sure the debt is very low. This means skipping graduate school, especially law school, but to a lesser extent medical school. @JL – I pretty much agree. I think consumerism and the “buy all the house you can” mentality is a contributing factor. After all, even if someone stepped in and got up to their neck in student loans, the loans can still be paid off if a nonconsumer lifestyle is adopted. Admittedly, though, it’s pretty much a lost (semi)decade and if the major is chosen unwisely, there’s really no increased earnings potential. What I like about these flow diagrams is the elimination of interst payments. In Canada, the banking system is an oligopoly. This may give it the financial strength to survive fianncial crises, but the cost is a major transfer of wealth from Canadians. this remains my favorite entry on this blog. The diagrams pretty much tell you all you need to know. I like your diagrams, too. But I would have added one which is a hybrid of the second and third diagrams because it is possible for someone to have debt yet have investments at the same time, just not enough of them to cover one’s expenses. This was my situation for about 9 years until I became debt-free but was still working. Of course, my favorite diagram is the last one which I have been for the last 2 years. Loved this post and loved the diagrams, I love charts and diagrams myself, it is an easy way to gage how your doing or explain points in simple terms where as a homeschooling parent I use things like these simple diagrams to teach my kids about financial management. We have a long ways to go but even on our poor income wages, I make sure I add monthly to build our assets.! I love coming here and reading all the informative posts, keep up the great work! I seem to straddle a couple of the examples. It does kind of hammer home to me how I need to be controlling personal expenditure more. I don’t like that leakage to “other people”! Your diagrams are very easy to understand for most basic situations. I think you need to make a diagram that further explains “assets”. I have borrowed money to acquire assets that generate money in excess of the interest that I pay. I am in debt but I make more money because I can borrow money at a very low cost. I then look for places that have a much higher return on investment that what the money cost to borrow. For example I borrowed money at 2% and bought stock that has a dividend of 6%, I net 4%, as long as the stock does not go down I make pretty good money. These diagrams are what our education system needs. I will be teaching my kids using flash cards like these. Hi im 18, I own some commodities with a networth of %7000. Re- ASSETS, In my opinion, the assets could be a happy family, good children, beautiful garden/ forest/ environment. People used to forget all these thing, they just focus on making money then they lose their family, their children grow up without their exist, the environment where they live in become pollution and they going to die very soon on their “ASSETS”. Jacob, I’m glad you’re doing more writing lately! In this case, I’m glad you’re popping open Visio and turning financial independence into images. I love the graphs. I can’t wait until my assets are large enough to cover my expenses. Right now I’m still paying off my student loans from college. I wish I could go back and tell my 18 year old self to not take those on! As soon as those are done, the 50-75% saving of income begins. Can’t wait! I think I’ve read this post about 10 times! I love the diagrams which made me think about money and everything I spend on it. I found this blog a year ago and at that time I had a lot of credit card debt. 12 months later I’ve now paid a significant portion of my debt, increased my savings and am always looking for ways to lower expenses and increase income. This is a great blog and thanks for sharing everything. Brilliant post, I love these diagrams, these diagrams are even better than the ones on Rich Dad, Poor Dad! The retirement cash flow diagram reminds me of Thomas Picketty’s new book, Capitalism in the 21st Century, where he argues that the people with this kind of cash flow are going to continue to grow wealthier as time goes on because wage-related economic growth will be slower than asset-related capital growth. Get your assets now! Great post! I’m in the asset accumulating stage. Need to spend less, earn more, and acquire more assets. Love this article…So true! Reminds me of a few books I’ve read. Having discovered the Investor Class for myself…I will never go back to paying someone else to use money as debt is the main inhibitor towards building wealth. This is much needed retirement advice that is definitely hard to come across. 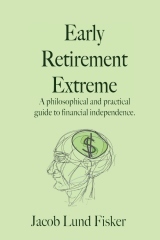 Anyone can achieve an early retirement if they simply get out of debt, stay out of debt, and focus on acquiring cash flow producing assets. Unfortunately, all we ever hear is that you must work for 40 years and dump money into a 401k until we’re 59.5 years old. Great post!